Are you new to Drive? Please download, complete this form and bring it along to your first class. Thank you. Soak the bamboo skewers in water for an hour. Combine all of the ingredients, except the capsicum, in large ziplock bag. Marinate in the fridge for 1 hour. Preheat the oven to 180 degrees C. Thread the chicken pieces, alternating with capsicum pieces, on the skewers. Line on a lightly greased pan and bake for 30 minutes, or until fully cooked through. In a medium bowl combine the coconut aminos, ginger, garlic, water, syrup and arrowroot. Set aside. Heat 1 tablespoon of the olive oil, on high, in a large pan or wok. Add the green onions and broccoli, sauté for 5 minutes. Remove from wok. Heat the remaining 1 tablespoon of olive oil and stir-fry the steak until almost done, about 4 minutes. Return the veggies to the wok and add the sauce. Heat until the sauce boils and thickens, about 3 minutes. Serve and enjoy. By using flavourful ingredients, like roasted capsicum and white bean hummus, this soup tastes like you've slaved over it all afternoon– but really takes less than 20 minutes to throw together and it's also delicious served cold on those hot days we've been having. This recipe is a great way to fit some quinoa into your diet. Quinoa is a protein-packed seed that is considered a “super food”. It’s s a complete protein, containing all 9 essential amino acids, and is gluten free. Take 1/4 cup of the roasted red capsicum, slice into strips and set aside. Place the remaining red capsicum in a blender along with the hummus and chicken stock. Blend until smooth. Transfer to a medium saucepan. Add the quinoa and chicken. Season with salt and pepper. Ladle the soup into bowls and garnish with the slices of red capsicum and chopped parsley. Chilli optional. Preheat the oven to 200 degrees C. Place a wire rack on a rimmed baking sheet. In a medium bowl combine all of the meatball ingredients. Mix well with your hands until all of the ingredients are evenly combined. Form golf ball sized balls and place in the oven. Bake for 25-30 minutes, until fully cooked. In a large soup pot, place the sesame oil over medium-high heat. Add the ginger, garlic, onions, and capsicum. Cook for 4 minutes. Add the bok choy and cook for another 4 minutes. Add the stock and tamari. Reduce the heat to medium-low. Use a vegetable peeler to remove all of the green skin from the zucchini. Cut each zucchini in half, width-wise, and use a spiral slicer to create long, angel-hair noodles. Add the noodles and the cooked meatballs to the soup pot. Simmer over medium-low heat for 10 minutes. Serve in shallow bowls, drizzled with sesame oil and sprinkled with minced green onion. Enjoy! Nutritional Analysis: One serving equals: 199 calories, 18g fat, 170mg sodium, 21g carbohydrate, 2g fibre, and 18g protein. In a medium frying pan combine the apricot preserves, tamari or coconut aminos, vinegar, ginger, garlic and sweet paprika. Place over low heat and mix often for 4 minutes. Rinse the chicken tenders and place in a baking sheet. Pour the apricot mixture over the chicken, and place in the fridge for 20 minutes. Turn on the high grill. Line a rimmed baking sheet with foil. Place a wire rack in the center of the sheet and arrange the marinated chicken in a single layer. Place in the oven on the top rack. After 5 minutes, use tongs to flip the chicken. Return to the oven for another 5 minutes. Allow the chicken to blacken slightly. Combine the mashed banana, eggs, coconut sugar, vanilla and almond extracts in a food processor, blender or simply whisk really well. Add the flour, soda and salt. Mix well. Let the batter sit for 15 minutes. Preheat coconut oil on your pan over medium heat. Ladle pancake batter by 1/4 cup onto pan. When bubbles form, flip the pancakes to cook other side. Serve with sliced banana and pure maple syrup. Enjoy! Nutritional Analysis: One pancake equals: 148 calories, 9g fat, 8g carbohydrate, 3g fibre, and 4g protein. Preheat the oven to 170 degrees C. Lightly grease a small casserole pan with olive oil. Place a pan over medium heat, add the olive oil, garlic, onions and capsicum. Sauté until soft, about 10 minutes. Remove from heat and allow to cool slightly. Add the spices, tomato paste, eggs and turkey. Mix well then transfer to the prepared pan, shaping into a loaf. Pour the passata evenly over the top of your loaf. Bake for 90 minutes, and until no longer pink in the center. Here's a recipe to spice up your breakfast. Egg whites, roasted asparagus & green Chilli and diced tomatoes create a tasty omelet that is bursting with flavour and packed with protein. Serve with a side of salsa and sliced avocado. 1 large green chilli, seeds removed and diced. Toss the asparagus and chillies together with the olive oil, salt and pepper and pan fry for 5-6 mins until they get a nice 'grilled' colour. Add the tomatoes and cook until soft, about 3 minutes. Season with pepper and salt and set aside. In a medium bowl whisk the egg whites and water. Lightly coat a medium non-stick skillet with non-stick cooking spray and place over medium heat. Add 1/4 of the eggs and swirl to evenly coat the bottom of that pan. Cook until the eggs have set, about 2 minutes. Use a non-stick scraper to lift the eggs up and let the runny uncooked egg flow underneath. Spoon 1/4 of the chilli mixture onto half of the omelet, fold over, and slide onto a serving plate. Repeat with remaining egg whites and chilli mixture. Nutritional Analysis: One serving equals: 163 calories, 5g fat, 6g carbohydrate, 2g fibre, and 26g protein. Spread a tablespoon of pesto over each wrap and set aside. In medium sized pan warm the olive oil over medium heat. Add the garlic and sauté until golden. Add the tomato and cook for another 3 minutes. Add the spinach and cook until it is soft and wilted. Remove the veggies from pan, set aside in a bowl. Pour the egg whites into the pan, season with salt and pepper. Cook until the egg is no longer runny. 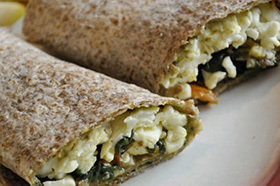 Arrange half of the egg whites in a line down the center of each wrap. Top with half of the veggies and then fold the ends up and wrap like a burrito. Nutritional Analysis: One serving equals: 288 calories, 10g fat, 28g carbohydrate, 6g fibre, and 21g protein. 1 cup Savoury yeast (buy online from www.organicbuyersgroup.com.au or health-food stores). If your not concerned about the gluten, then use Unprocessed Bran from the supermarket. Preheat the oven to 200 degrees c. Lightly grease 2 baking sheets with olive oil. Rinse the chicken breasts and pat dry. Place between two sheets of ba paper aking paper and pound it down to 2.5cm thickness. Trim off any excess fat and cut into 4cm wide strips. Cut the strips into about 80 4×4 cm nuggets. Arrange 3 shallow bowls next to your prepared baking pans. In the first bowl combine the almond flour, arrowroot starch, salt and pepper. In the second bowl combine the Dijon, eggs and olive oil. In the third bowl combine the gluten free cracker crumbs and savour yeast or bran. Take each chicken piece and drag it through bowl #1, dip into bowl #2 and roll in bowl #3. Place each coated nugget on the prepared baking sheets. Bake the chicken for 20 minutes, then turn the oven on high grill for about 2 minutes to get them really crispy. Serve on their own or with homemade or natural tomato sauce. Be mindful of the sugar and salt in store bought condiments. *Freeze leftover nuggets in a freezer safe bag. To reheat place on a baking sheet at 180 degrees C for 20 minutes, or until warmed through. Wash cauliflower, discard the leaves, and chop into small pieces. Grate the pieces with a food processor. In a large skillet heat the olive oil over medium. Add the shredded cauliflower. Sauté for about 5 minutes, until tender. Season with salt and pepper. Serve as you would traditional rice. Combine tamari, mirin, nectar, apple cider vinegar and chicken stock in a small saucepan; bring to a boil. Reduce heat; simmer 3 minutes. Remove from heat. Heat a large nonstick pan or wok over medium-high heat. Add 2 teaspoons toasted sesame oil to pan; swirl to coat. Add chicken breasts to pan; cook 3 minutes on each side or until browned. Transfer to a cutting board; cool slightly. Cut into 1-inch slices. Return pan to medium-high heat; add remaining 1 teaspoon toasted sesame oil to pan. Add snow peas and onions; saute 2 minutes. Add Tamari mixture and chicken to pan; cook 2 minutes or until liquid is syrupy and chicken is thoroughly heated, stirring frequently. Place 1 cup rice in each of 4 shallow bowls; top each serving with 1 cup chicken mixture. Nutritional Analysis: One serving equals: 256 calories, 6g fat, 621mg sodium, 25g carbohydrate, 6g fibre, and 28g protein. Preheat the oven to 180 degrees C. Lightly grease a casserole dish with olive oil. In a small pan, place the olive oil over medium heat. Add the pine nuts and pecans. Saute until golden brown. Remove from heat and pulse in a food processor with the parmesan and dash of salt. Set the nut mixture aside. In a large frying pan, place the olive oil over medium heat. Add the garlic and onions and cook for 5 minutes. Add the pepper and eggplant and continue to cook for 5 minutes. Mix in the chicken, tomatoes, basil and wine. Bring to a boil, then simmer for 5 minutes. Spread the chicken and veggie mixture into the prepared casserole pan. Evenly sprinkle the nut mixture over the top of the casserole. Cover with foil and bake for 50 minutes. Remove the foil and bake for another 10 minutes. Enjoy! Nutritional Analysis: One serving equals: 223 calories, 7g fat, 320mg sodium, 19g carbohydrate, 9g fibre, and 19g protein. Heat the olive oil in a large fying pan or wok. Add the garlic. When the garlic is browned add the asparagus. Stir fry for 5 minutes or until the asparagus turns bright green. Add the chopped stir fry vegetables, cabbage, and pineapple. Stir fry for 5 minutes or until the vegetables are tender. Add the cooked chicken pieces and mix in the teriyaki sauce. Stir fry for another minute, until the sauce is evenly distributed. Nutritional Analysis: One serving equals: 117 calories, 1.8g fat, 15.8g carbohydrate, 4g fibre, and 10.7g protein. Preheat the oven to 220 degrees C.
Trim the ends off the asparagus, and chop into ½ inch pieces. Place in a medium bowl and combine with the olive oil and a dash of salt and pepper. Transfer to a baking sheet and bake for 10 minutes. Trim the ends from the zucchini and use a veggie peeler to remove the green skin. Cut the zucchini in half, width-wise, then run through a spiral slicer to create long, angel hair noodles. Place the noodles in a large bowl. Add the sun dried tomatoes and roasted asparagus. In a small bowl combine all of the dressing ingredients. Pour the dressing over the noodle salad and mix well to combined. Pre-heat your grill or grill pan. Lightly grease your hands, then press the meat into the wooden skewers until it covers about 8-10 cm in an elongated meatball shape. If the meat is not sticking then add some more almond meal. Grill for about 8 minutes per side. Place the flour in a shallow bowl. Rinse the chicken and pat dry. Season both sides of the chicken thighs with salt and pepper. Dredge through the coconut flour. In a heavy pan or Dutch oven, heat the olive oil over medium high. Add the chicken and cook until browned, about 4 minutes per side. Add the shallots and garlic, cook until softened, about 5 minutes. Add the wine, mustard and chicken stock. Reduce the heat to a simmer, cover and cook for 30 minutes. Add the tomatoes and fresh dill. Season with a little more salt and pepper. Cook over high for 5 minutes. Serve warm. Rinse the chicken and cut into 1 inch cubes. Place the olive oil in a large skillet over medium heat. Add the garlic and onions, sauté for about 10 minutes, until soft. Add the broccoli, carrots and chicken and cook an additional 10 minutes. Add the bok choy and zucchini. After 5 minutes add 1/4 cup of chicken broth, cover, and cook an additional 10 minutes. In a small bowl combine the remaining 1/2 cup chicken broth, corn flour, sesame oil, vinegar and tamari. Add the seasoned mixture to the skillet, along with the chopped mango, and cook for another 5 minutes, stirring constantly until the mixture thickens. 2 small-med zucchini, yellow or green. 250g canned 100% diced tomatoes, reduced over a high heat for 5 min. Wash the zucchini, and slice using a julienne blade in your processor or grater and place in a medium bowl. Add the eggs, flax meal and bran. Mix until fully incorporated. Coat a 23-cm pie plate with coconut oil. Press zucchini mixture onto the bottom and up sides of pie plate, forming a crust. in a 190 degree C oven for 10 minutes. Remove from oven and set aside to cool. Discard the cashew soaking water. Combine the cashews, lemon juice, water, olive oil, salt, paprika, garlic and pepper in a blender to for a 'cheese like' spread. Mix until completely smooth. Set the cheese spread aside. In a large frying pan warm the coconut oil over medium-high heat. Add the onion, capsicum and garlic. Sauté for 3 minutes. Add the mince and cook until the meat has turned in colour and onion is tender. Stir in fennel seeds, tomato puree, and oregano. Cook through until the liquid is reduced. Remove from heat. Spread the meat mixture over the crust. Sprinkle with the cheese spread. Bake in a 180 degree oven for 20 to 25 minutes or until bubbly and heated through. Slice into wedges to serve. In a small bowl combine the yogurt, 1 tablespoon lime juice and the mint. Pour over the cooked quinoa and mix well. Season with salt and pepper. In another bowl combine the fruit, agave nectar and remaining lime juice. Cover and refrigerate each bowl for 2 hours, to allow the flavors to emerge, then combine the fruit with the quinoa and serve. Nutritional Analysis: One serving equals: 114 calories, 1 fat, 13mg sodium, 20g carbohydrate, 2.5g fibre, and 6g protein. Combine all of the ingredients, except the lettuce leaves and avocado, in a slow cooker. Cover and cook on low for 5 hours. Remove the chicken thighs, shred with a fork, and mix back in. Serve, using a slotted spoon, on the lettuce leaves. Garnish with sliced avocado, chopped cilantro and a sprinkle of Salt & Pepper. Enjoy! Nutritional Analysis: One serving equals: 202 calories, 6g fat, 589mg sodium, 14g carbohydrate, 5g fibre, and 20g protein. Place a steamer basket over a 3L pot, filled with water up to the bottom of the basket. Bring the water to a boil, add the broccoli, cover and steam for 3 minutes. Immediately drop the broccoli into a bowl of ice water. After a few minutes drain the broccoli and set aside. In a large pan warm the olive oil over medium heat. Add the garlic and saute until golden. Add the broccoli, olives and salt. Saute for another 5 minutes until tender. Remove from heat, place in a serving dish, sprinkle with pine nuts and toss with lemon juice. Nutritional Analysis: One serving equals: 58 calories, 4.4g fat, 3g carbohydrate, 7.1g fibre, and over 2.5g protein. Combine the tuna, onion, capsicum, and apple in a medium bowl. In a small bowl mix the avocado, mayo and dill. Add the avocado mixture to the tuna and mix until well combined. Arrange the lettuce leaves on two plates, and fill with tuna. Garnish with a dash of pepper. Nutritional Analysis: One serving equals: 124 calories, 4.5g fat, 7g carbohydrate, 2.7g fibre, and 14g protein. Putting dinner in the slow cooker before you leave for work in the morning is one of the easiest ways to ensure that you'll be eating a healthy dinner that night. This chicken breast comes out so tender that it literally falls apart - it's delicious. In a large frying pan place the olive oil over medium heat. Add the onions and garlic and sauté for 5 minutes. Rinse the chicken and pat dry. Season with salt and pepper. Add to the pan, browning each side for about 5 minutes. Transfer the contents of the pan to your slow cooker and top with the remaining ingredients. This recipe for Teriyaki Rib Eye and Chicken Wrapped Asparagus is savoury and delicious. It’s a wonderful way to get your protein and veggies all at once! Fight the urge to serve this meal with traditional rice, and instead shred a head of cauliflower and sauté into low-carb, guilt-free rice. Enjoy! Bring 5cm of water to boil in a large pan. Add a sprinkle of sea salt. Wash and trim the ends from 2 bunches of asparagus. Add to the boiling water and blanch for about 5 minutes, until tender and vibrantly green. Remove from heat, drain and place in a bowl. Toss with the sesame oil, lemon juice and lemon zest. Season with salt and pepper. Set aside. Combine the sake, mirin, ginger, garlic, coconut aminos and maple syrup in a bowl. Pour over the meat in a shallow container. Place in the fridge and chill for an hour. Heat the olive oil in a grill pan or skillet. Remove the meat from the fridge. Wrap pieces of meat around stalks of asparagus. Place in the preheated pan and cook until browned, about 5 minutes per side. Remove from heat and serve immediately. Enjoy! Nutritional Analysis: One serving equals: 120 calories, 8g fat, 59mg sodium, 6g carbohydrate, 1g fibre, and 14g protein. Combine all ingredients in a saucepan. Stir the mixture well. Put it on medium heat and bring to a boil. Turn down the heat to low and simmer for a couple minutes. Stop the heat and cool the mixture. Preheat oven to 200degrees C. Lightly grease a baking sheet with coconut oil. In a shallow bowl combine the almond meal, salt and garlic powder. In another shallow bowl whisk the coconut milk and egg. Dip each onion ring in the milk mixture and then coat with the almond meal mixture. Place on prepared baking sheet. Bake for 20 minutes. Remove from oven, flip each onion ring, then return to oven for an additional 10 minutes. Heat a grill pan and lightly coat with coconut oil. Place the chicken breasts on the grill pan, and cook 4 minutes each side, until there is no longer any pink in the middle. Remove chicken from heat and slice. Prepare each plate with a pile of micro greens, sliced mango, goat cheese crumbles, a few onion rings and then top with teriyaki chicken.